UNITED NATIONS, August 8 -- As three Ethiopian peacekeepers lay injured by a land mine in Abyei last week, the UN asked Khartoum for permission to fly in a helicopter from Wau in South Sudan. "That's a different country," Sudanese authorities reportedly replied. By the time a medical evacuation helicopter arrived from Kadugli in Southern Kordofan, considered Sudan proper, the peacekeepers had died. 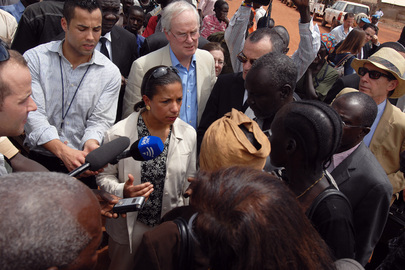 Outside a UN Security Council meeting on the subject on Monday, Inner City Press was told by sources that US Ambassador Susan Rice inside was saying that the UN should not have "given Sudan a veto" over flights into the "no man's land" of Abyei, but should just have flown. When Ambassador Rice left the meeting, Inner City Press asked her, "should they have flown from Wau without waiting to get permission?" "Yes, in my opinion," Ambassador Rice said. She paused then continued, "there's a risk involved in that and we all have an interest in the security of peacekeepers. But at a certain point you gotta weigh the risk of the helicopter crew, if they had been notified that it was coming and the tail number, then the government would have been responsible if it had done something untoward." In Wau, Susan Rice on the mic, opinion personal? "It's not beyond them to do something untoward," Rice said. "But the loss of these peacekeepers may have been prevented." Again she paused, for emphasis. "That my personal opinion, I expressed it in there, but it's my personal opinion." But when the US Permanent Representative to the UN makes a point in the Security Council, is it a personal opinion? Watch this site. UNITED NATIONS, August 8 -- The delay in medical evacuation of three peacekeepers from Abyei raises the question of whether Abyei, even now, belongs more to Khartoum than South Sudan. Inner City Press has pursued the issues for days, getting the UN to belatedly admit that they asked to fly to Abyei from Wau in South Sudan, but were blocked by Khartoum and later came from Kadugli, by which time the three peacekeepers died. Now in a closed door Security Council meeting, the UN has been criticized for deferring to Khartoum on flying from South Sudan to Abyei, essentially "giving Sudan a veto." The question was raised: why doesn't South Sudan, which also claims Abyei, then have a similar veto over flights from North Sudan into Abyei? Meanwhile, Inner City Press asked Khartoum's Permanent Representative to the UN outside the Security Council on Monday to respond to the UN charge that they denied permission to fly from Abyei, saying "that's a different country." "We never rejected" it, he replied, adding "Wau is in a different country." He criticized the UN for focusing on the issue, which he called a "little nitty gritty." He said he would not speak at the UN TV stakeout, because he is fasting. Inner City Press offered a "stakeout at sunset." Video of his answers was nevertheless obtained, and put on YouTube, here. Watch this site.